English busybodies Los Campesinos! aren't happy with just being a band anymore. Even though the outfit are still primed for the writing, recording and touring thing, having released three albums in a two-year span, it seems as if the troupe know there is more to life than just being in a band. With that in mind, Los Campesinos! have announced their foray into the publishing world. A blog post on their website explains that on top of their musical day jobs, the band will now be putting together a quarterly zine called Heat Rash. The publication will scrap together anything the band fancy, from artwork to prose and maybe the occasional piece of music. It will be available on a subscription-only basis. 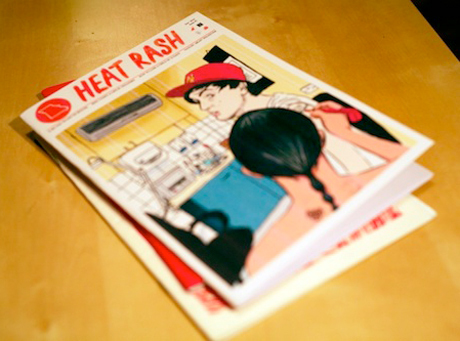 "Heat Rash is a quarterly zine and music bundle, from our hands to your front door, including exclusive writing, artwork, music and more, available only as a result of being a Heat Rash member," a statement says. "Heat Rash is intended to allow us to act in the moment, to talk about what we want to, as a platform for other mediums of 'art,' and to write and release songs in a more spontaneous way." A year's subscription, which will set you back £25 (about $40 Canadian), includes quarterly instalments of the zine, limited seven-inches and exclusive MP3s, discounts on band merch and pre-sale concert tickets, among other goodies. An incentive to subscribe now is the promise of two brand new Christmas-themed tunes: "Kindle a Flame in Her Heart" and "The Holly and the Ivy." The songs come packaged with a digital hymn sheet so you can sing along. You can check out "Kindle a Flame in Her Heart" below. Kindle A Flame In Her Heart by Los Campesinos! Los Campesinos! "When Christmas Comes"